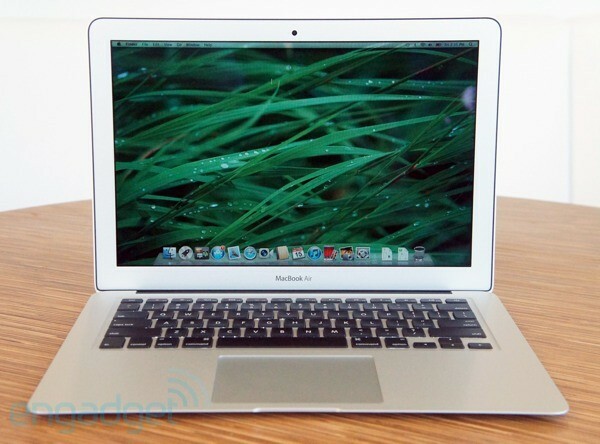 The 2012 MacBook Air vs. the 2011 model: what's changed? 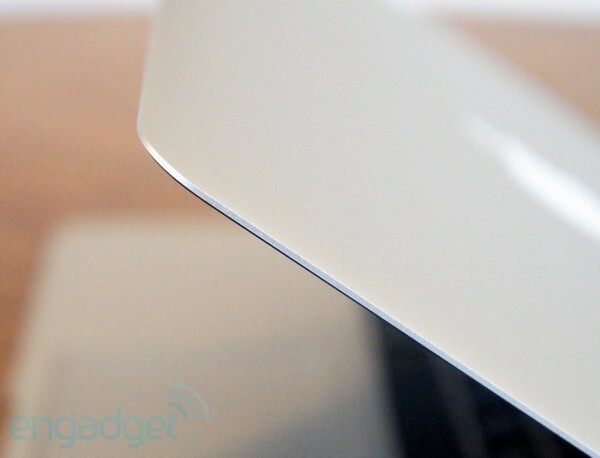 The last time we reviewed the MacBook Air, we didn't have a whole lot to compare it to. Sure, there was the original Samsung Series 9, but it was more expensive, at $1,649, and ran off a standard-voltage processor, often at the expense of battery life. Companies like Lenovo and Toshiba already had deep experience making ultraportables, but those notebooks generally weren't as light, or as skinny, as the Air. A year ago, too, Ultrabooks, as we now know them were little more than a concept as far as the computer-buying public was concerned. That sounds promising, making an already-excellent laptop faster and less expensive. Still, with so many comparable products on the Windows side, we have to wonder, does Apple really continue to define the category or have other companies narrowed the gap? Let's find out. If we could ask Apple to change one thing about the Air, it would be to make that pretty aluminum casing a little more durable. Anyone who's spent time with a unibody Mac can tell you that smooth metal finish is as scratch-prone as it is beautiful. Unless you handle it with kid gloves, the likelihood that you'll ding it within the first day is fairly high, which kind of saps the fun out of unboxing a new $1,200 toy. To avoid doing any immediate damage, we'd buy some sort of skin along with the laptop itself (Speck's SeeThru Satin case is an Engadget staff favorite). Given that the dimensions and overall aesthetic haven't changed, the only cosmetic differences between this year's Air and the last-gen model are the ports. Starting on the left side, the tried-and-true MagSafe connector has been replaced by MagSafe 2, which has a thinner opening. Unfortunately, that flattened shape renders it incompatible with older adapters. If you're dead-set on reusing your scratched-up old power brick you can make it work using a $10 adapter, but that makes for a rather clumsy setup. The USB port adjacent to it has naturally been upgraded from USB 2.0 to 3.0. On that same side, you'll also find a 3.5mm headphone jack and microphone, just as before. 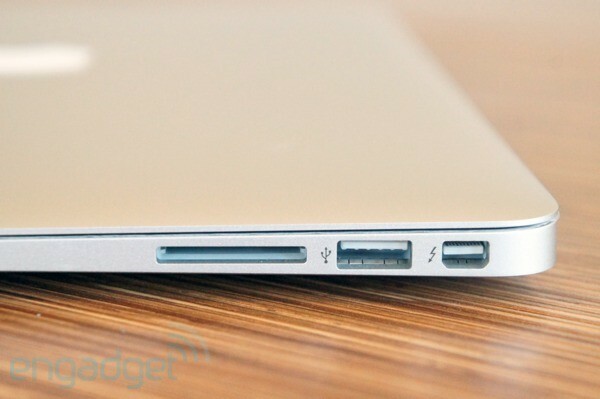 Move along to the right, where you'll see another USB 3.0 socket, along with a Thunderbolt port and SD card reader. If you think you might buy the 11-inch Air instead, that, too, has been refreshed with MagSafe 2 and USB 3.0, but lacks a memory card reader, as it always did. Finishing our tour, the FaceTime camera tucked into the bezel now does 720p video. 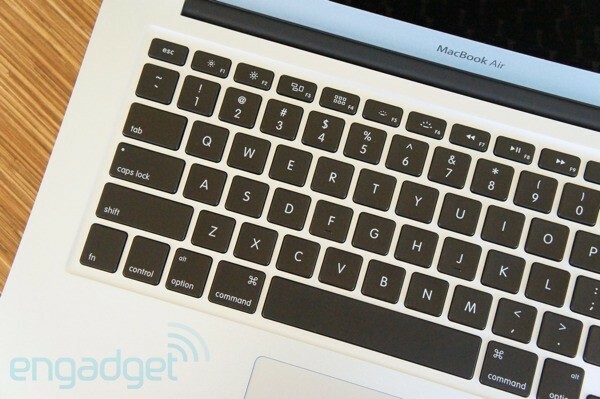 It's still the best keyboard-and-touchpad combination you'll find on a laptop this size. When Apple re-issued the Air last year, it introduced a retooled keyboard with springier, bouncier keys and also backlighting. The result was a clear, much-appreciated improvement over the looser keys used on the earlier models. So it's no surprise, then, that Apple chose not to re-invent the keyboard yet again in 2012. The keys are just as comfy as ever, and though they're not quite as cushy as what you'll find on a MacBook Pro, they still offer more travel than most Ultrabook keyboards. 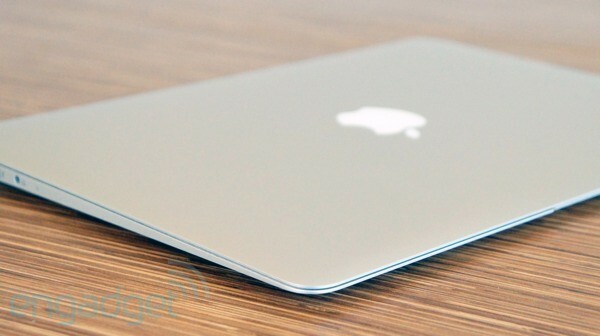 Also unchanged: that spacious glass trackpad. It's still, hands-down, the best laptop trackpad we've tested, with a smooth, low-friction surface that responds impeccably to two-finger swipes, pinch-to-zoom and simple cursor navigation. Palm rejection is excellent as well, and we enjoyed flawless tracking in both OS X and Windows 7, which we installed using Bootcamp. The built-in button, too, is quiet and easy to press. All told, it's still the best keyboard-and-touchpad combination you'll find on a laptop this size. As we've said in other reviews, the problem isn't that other computer makers are incapable of building a precise trackpad or an ergonomically sound set of keys. No, the catch is that they so rarely manage to pull off both. We've tested too many Ultrabooks that stumble on at least one major input device, if not both. Maybe they offer a tactile keyboard and flaky trackpad, or perhaps they bring precise navigation, paired with shallow keys. Considering how often we interact with these parts of a laptop, it's critical PC makers not screw these things up, and we naturally favor those companies that succeed in getting both right. If you like, you can go ahead and tell yourself the next generation of Airs will have Retina displays. For now, though, you're looking at the same 1440 x 900, LED-backlit display used in the 2011 model. We can't guarantee you won't be disappointed if you happen to be shopping in an Apple Store, making side-by-side comparisons with the next-gen MacBook Pro. Heck, the Air has competition even from other Ultrabooks, such as ASUS' 1080p Zenbook Primes. Still, compared to what you'll find on most ultraportables, it's quite good. It's crisper, for one, and also offers satisfying contrast and fairly wide viewing angles. At times, you might have to adjust the screen angle to compensate for glare, but nonetheless, you shouldn't have a problem crowding around the laptop with a friend or two to re-watch that bombshell of a Mad Men finale. The Air's speakers push out surprisingly loud sound for such a petite machine, though the quality isn't anything to write home about. Across various genres -- classic rock, pop, hip hop -- songs sound pleasant, though, as with most laptops, you'll still want to pair it with external speakers or maybe a Jambox to unlock a wider soundstage. Now this is the section you've been waiting for, is it not? We already know how the MacBook Air looks and feels, but how does it perform with that faster processor? The $1,199 model we tested has a 1.8GHz Core i5 CPU, specifically, along with 4GB of RAM and a 128GB solid-state drive. (The last Air we tested had similar specs, but sported a Sandy Bridge Core i5 CPU clocked at 1.5GHz.) As you can see in the tables above and below, the latest generation offers a considerable performance boost over last year's model, in both Mac and Windows benchmarks. Its PCMark Vantage score of 13,649 is simply blistering. Record-breaking, even. We haven't seen an Ultrabook that comes close to this -- not even the ASUS Zenbook Prime UX21A, which has a Core i7 Ivy Bridge CPU, 4GB of RAM and the same integrated Intel HD 4000 graphics. Granted, the UX21A is the only other Ultrabook we've tested to date with a third-generation Core processor, so we expect there's room for other PC makers to close the benchmark gap once they get their refreshed systems into the hands of reviewers. Still, it's impossible to shrug off that delta in scores entirely: there's no reason the UX21A should score 3,100 points lower in PCMark and nearly 1,300 points less in 3DMark06. So what do those raw scores translate to in real-world performance? For starters, we timed an 18-second start-up when we were booting into OS X (with Windows, it was closer to 40 seconds). We also ran the disk benchmark ATTO to pull off a more direct comparison with various Ultrabooks we've tested recently, and the SSD inside showed top read / write speeds of 551 MB/s and 521 MB/s, respectively. That's just a shade faster than the ASUS Zenbook UX31, which had been holding steady as the Ultrabook transfer speed champ for about eight months. It's also worth spelling out that the Air stayed quiet throughout our testing period, and surprisingly cool too. If we were betting types, we would have guessed the battery life wouldn't be much different from last year's model: after all, this year's Air packs the same 50Wh cell as its predecessor, and Apple is once again promising between five and seven hours of runtime. Besides, early Ivy Bridge benchmarks have suggested the battery life between machines with second- and third-generation Core chips is similar. In fact though, the 2012 Air lasted six hours and 34 minutes in our rundown test, which involves looping a video with WiFi on and the display brightness fixed at 65 percent (in the case of Macs, 10 out of 16 bars). That's about an hour longer than what we got when we ran the 2011 Air through the same test last year. This also makes it the longest-lasting 13-inch Ultrabook we've tested -- a distinction long held by the HP Folio 13. 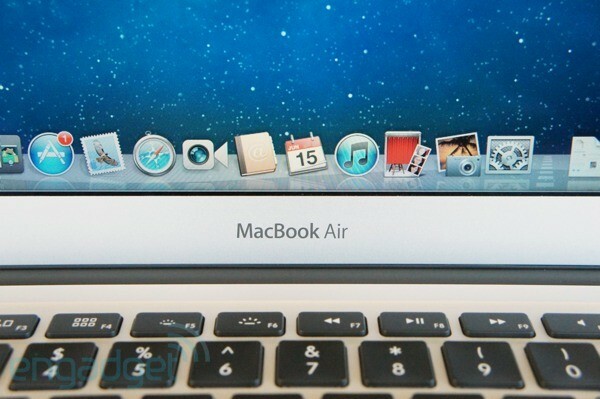 Though Apple is on the cusp of releasing its next-gen OS, dubbed Mountain Lion, those of you who purchase a MacBook Air within the next few weeks will have to make do with plain old Lion. Fortunately, upgrading will be free for anyone buying one of Apple's latest laptops, and for everyone else upgrading will be fairly cheap: just twenty bucks will get you a license for as many machines as you like. At that point, you'll enjoy features like notifications, iMessage, deep Twitter and iCloud integration and Power Nap, which keeps web-based apps up to date while your machine is asleep. If you're not in a rush, settle in with our in-depth Mountain Lion preview to get a feel for what's coming. Like Apple's other computers, the Air is backed by a one-year warranty, which includes 90 days of free phone support. As always, you can extend that coverage to three years through the company's Apple Care plan. In the case of the Air, that package costs $249 (compared with $349 for the MacBook Pro with Retina display). 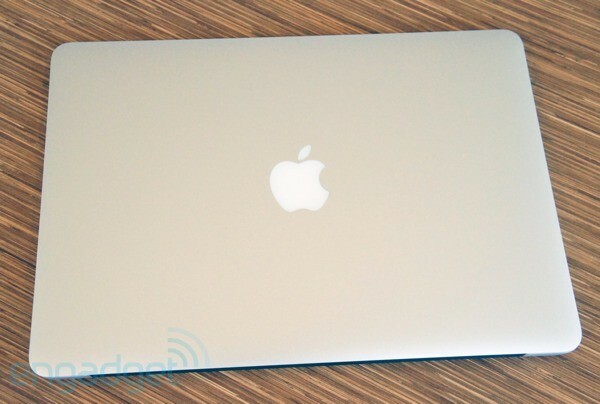 The MacBook Air starts at $999 for the 11-inch version we didn't review here. The base model comes with an Ivy Bridge Core i5 processor clocked at 1.7GHz, 4GB of RAM and a modest 64GB solid-state drive. The higher-end $1,099 model has the same CPU and four gigs of memory, except it offers double the storage space. You can also step up to a 2Ghz dual-core Core i7 CPU ($150), 8GB of RAM ($100) or a 512GB hard drive ($800), but these upgrade options are only available if you start with the pricier $1,099 model. It's a similar deal with the 13-inch version. The entry-level $1,199 configuration features a 1.8GHz Core i5 processor, 4GB of memory and a 128GB SSD. The $1,499 model is the same, except with 256GB of storage capacity. As with the 11-incher, you'll need to select that top-tier model if you want to upgrade to 8GB of RAM, a 512GB SSD or that 2GHz Core i7 processor. What's your budget? And how much time are you willing to spend wading through the options? If you're the sort of platform-agnostic type just looking to get the best bang for your buck, you have a sprawling, almost unwieldy selection before you. Even if you ruled out all those 11-, 14- and 15-inch Ultrabooks, you'd find yourself faced with dozens of 13-inch contenders, many of them priced in the same ballpark. For the sake of keeping things simple, we'll stick to the models that seem truly promising. Of all the companies challenging Apple's lead, ASUS has been presenting the most compelling reasons to buy a PC instead. Though the outfit's first Ultrabooks performed well and showcased some striking industrial design, they suffered from flat keyboards and flaky touchpads. Now, though, the new Zenbook Primes appear to correct both these shortcomings, all while ushering in 1080p IPS displays and improved performance. We've yet to test one of the 13-inch models, and we still don't know how much these will cost, but it would seem, tentatively, that ASUS' second round of Ultrabooks are about to hand Apple some persuasive competition. People eyeing the Air for its speed, thinness and beauty should also give the Samsung Series 9 a long, hard look before pulling the trigger. In terms of build quality, it's on par with the Air, and there's an argument to be made that its matte, 400-nit, 1600 x 900 display is actually better than the reflective 1440 x 900 Apple is offering. Here, too, the performance is brisk and the battery life is long, though we confess we've only tested the 15-inch version so far. Speaking of which, for those of you who were disappointed when Tim Cook failed to announce a 15-inch Air, the bigger-screened Series 9, just 0.58 inches thick, is still, in some ways, the closet thing you've got. And it just happens to be one of our very favorite laptops of the moment. The Air falls short of its competitors in a couple categories, but as an all-around performer it triumphs. We could go on and on about 13-inch Ultrabooks, but as we continue further down the list, we'll start mentioning more trade-offs, from cheap build quality (Acer Aspire S3) to crowded keyboards (Toshiba Portege Z935). We actually have a sweet spot for the Lenovo IdeaPad U300s, despite the fact that it's one of the only machines in its price range missing an SD slot, higher-res display and backlit keyboard. It's just so gorgeous, well-made and comfortable to use that we're willing to forgive these shortcomings somewhat. In any case, the problem with the U300s and many of these other Ultrabooks we've reviewed is that they haven't been upgraded to Ivy Bridge yet. All these other potential drawbacks aside, we're reluctant to sell you on a kind-of expensive laptop with dated internals. And what of the Ultrabooks we haven't tested yet? The ones that were on display at Computex earlier this month? Well, this might be as good as time as any to give some serious thought to Windows -- specifically, whether you want to stick around for Win8, and whether you'd prefer using the new OS on a touchscreen. With few exceptions, the most compelling Ultrabooks on offer there (this, this, this and this, for example) were built with touchscreens to help make the most of Microsoft's upcoming, touch-friendly OS. Sure, you might be loathe to track fingerprints all over your 1080p display, or maybe you agree with Mr. Cook that tablets and notebooks are best kept separate. But if you're already jazzed about Windows 8, you should at least consider waiting for those touch models. The operating system was built for fingers, after all, and if that's appealing to you, the Air, Series 9 and non-touch Zenbook Primes might all be the wrong choice for you. At first blush, the MacBook Air doesn't appear to have changed much between 2011 and 2012: it looks exactly the same, save for those USB 3.0 ports and new MagSafe2 connector, and even the 50Wh battery remains unchanged. As for those faster Ivy Bridge processors, well, every PC maker is refreshing their Ultrabooks with Intel's new chips, if they haven't already. We can see where you might expect similar performance across the board, especially with other specs being more or less equal. But you'd be wrong: those tweaks Apple made on the inside amount to some significant performance enhancements, and place the Air at the head of the (very crowded) pack. The battery life is about an hour longer than it was last year, making this the most longevous 13-inch lightweight on the market. By several metrics, too, it steamrolls the competition in terms of speed, even when pitted against another Ivy Bridge machine. Just as important, the Air continues to have the best keyboard-and-trackpad combination of any ultraportable -- something Ultrabook makers are still struggling to get right. All that said, the competition is stiffer this time around: Samsung's Series 9 laptops remain some of our favorites, even if they are pricier. What's more, the Air actually falls short of its competitors in a couple categories -- namely, display quality (winner: the Zenbook Primes) and port selection (winner: the HP Envy Spectre 14). All told, too, there will be some users who decide against all these machines in favor of touchscreen Ultrabooks -- something you won't find Apple making any time soon. Even so, as an all-around performer, the Air triumphs. It ticks off the most boxes, and in particular, succeeds in the areas that matter most to shoppers: speed, longevity and comfortable design. Until PC makers can get all these things right, the Air remains the ultraportable to beat.